It requires an extra "device handle" passed to the functions, even if such a device handle is not needed or desired. Luckily, there is a way to hack around this. **         direction = _[output]_ or _[input/output]_. **                           structure returned by <Init> method. We pass a parameter which is not used at all. If that parameter is not used, why enforce it at all in the API? That parameter would make sense if I want to have concurrent access to the peripheral (e.g. if I have an RTOS and multiple tasks that want to use a Bit I/O). But in my case I do not use an RTOS, and Processor Expert should know this. 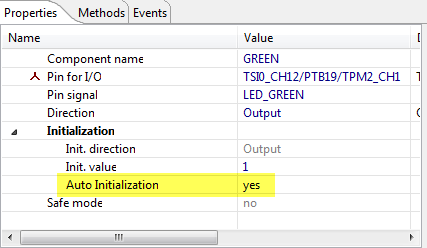 I would expect Processor Expert to take advantage of this knowledge, but at least up to MCU10.5 it does not. The good news is: I can hack around it. The macros are what is implemented inside the methods (which are using the NULL parameter, but do not use it). The positive impact: instead of 1544 bytes, the optimized version needs 1416 bytes of code for the application, about 10% less. The Processor Expert BitIO_LDD component requires a device handle passed to very function in its API, but this parameter is not used at all inside the functions if there is no RTOS used. Even with using an RTOS, and not needing concurrent access to the bits, the parameter is not necessary and only increases code size and code latency. But macros could be used to bypass this for better code efficiency without losing the advantage of using Processor Expert. It is just that these additional macros are hacking around something which Processor Expert should do out of the box. It would be very cool if Processor Expert could have the property "do not use device handle pointer" or something similar. At least Processor Expert knows that it is not using the parameter, so I would expect it would create the API/macros as I did above for better code efficiency.